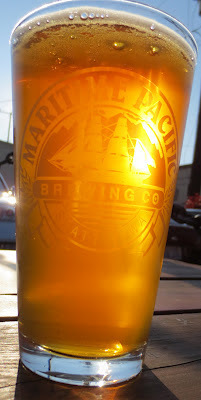 Over the weekend I paid a visit to Maritime Pacific Brewing Company in Ballard. It was such a nice day, we sat outside at one of the picnic tables located out front. Plus we had a dog with us, so she could enjoy the nice weather too. When our server arrived we all ordered our drinks. I went with the Islander Pale Ale. As the picture shows, it's a beautiful golden-blond color. Like their brew list describes, "it has a gentle malt flavor and subtle hop character." This brew definitely hit the spot on a nice, warm, sunny day. It was light and refreshing. Like you would expect, Maritime Pacific offers a full range of brews, from a Pale Ale to a Porter. If you go to Maritime Pacific Brewing Company, you have to try the Fried Pickles. These spicy dill pickles are lightly breaded and fried to a golden crisp. Seriously tasty! I love salads, and MPBC did not disappoint with their Field Greens Dinner Salad. The fresh organic field greens are tossed in a tamarind-ginger vinaigrette. It's topped off with cherry tomatoes, goat cheese (YUM!) and candied cashews. If you like salads, you must try this! Even if you don't like salads, you must try this! I wanted to try a sampling of the sliders offered, so I started with their vegan slider. It's made with black beans, hominy, onions, garlic and spices. You can choose from any of their house made sauces to top your sliders. The sauces they offer are: Jolly Roger Habanero BBQ, Nightwatch Stone-ground Mustard, Scotch Bonnet Rasta Remoulade, or Smoked Sweet & Sour BBQ. I went with the Nightwatch Stone-ground Mustard for this slider. This vegan slider was very tasty! Definitely a good choice for vegetarians or vegans. I would order this one again! For the meat-eater inside me, I went with the Double Lil' Jollys. It's plain and simple: meat + bun. I chose the Smoked Sweet & Sour BBQ sauce for this slider. This one was good, nothing too exciting, but good. Personally, I like the veggie slider better. It has a little more flavor. Finally, I chose the Lil' Mahi's slider. This one is made with fresh, pan seared Mahi-Mahi. It's topped with roasted jalapeno tartar and shredded savoy cabbage. This was my favorite slider of the three I tried. The fish was cooked perfectly, and the tartar was the perfect sauce to finish this one off. I highly recommend heading over to Maritime Pacific Brewing Company on a nice, sunny afternoon or warm evening to try one of their many brews and some tasty pub grub!